Wait, don’t throw your Mason Jar away just yet it is still very much alive! The best thing about empty Mason Jar Candles are the several different resourceful ways they can be used after the wax is gone and you’ve had a chance to clean out your Mason jar candle. Celebrate Summer by engaging in a couple fun seasonal DIY interior decoration projects to compliment your beach house environment. Make your beach house stand out and give it a true beach atmosphere. Depending on the size of your Mason Jar, take a photo and trim it just enough to fit inside your jar. Fill it with your local beaches’ sand to hold the picture in place and add some other beach house related objects in there. It could be seashells, conches, coral, and sea stars. 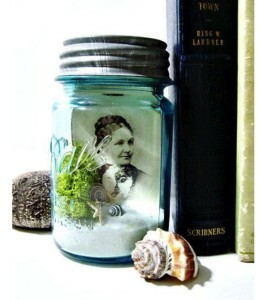 You can even decorate the outside of the jar by hot gluing any of these objects to it for a more lively effect. 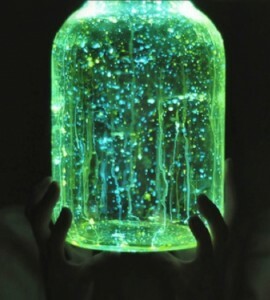 Materials & Directions: Glow Sticks, Glow in The Dark Paint (you can use both, the paint is used to “dot” the circumference of the jar), and a Paintbrush. It would be best to “dot” the jar first with the paintbrush, then break open the glow sticks and do a splatter pattern on the inside of the jar. Glow in the dark glitter would also be a cool addition too! This little decoration is a perfect addition for a “Space Themed” beach house. 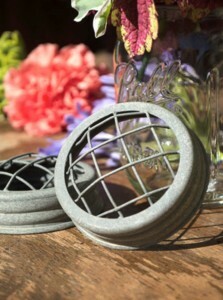 Mason Jar Flower holder s make lovely ornaments for your beach house. 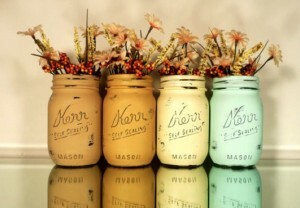 You can make this Mason Jar DIY project as hard as you want it to be. If you would like to have your flowers held in a neat order then you are going to have to make what is called a “frog lid”. The “frog lid” is a precisely cut circular piece of coiled wire that is supposed to fit under the mason jar lid. The coiled wire and its gridded system allows the flowers to stay in place. Painting the mason jar beach house and summer themed colors would also be fitting too. If you are having a hard time finding a use for your mason jar, well you can just simply use it to drink out of. 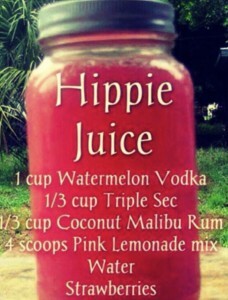 “Hippie Juice” seems to be a good summertime drink for hang out sessions at your beach house and a tasty drink to serve at BBQs. This entry was posted in Repurpose. Bookmark the permalink. ← Need a Last Minute Mom’s Day Gift?… Get Mothers Day Candles!